Earlier this year, Khader Adnan completed a 66-day hunger strike, the longest carried out by any Palestinian prisoner. 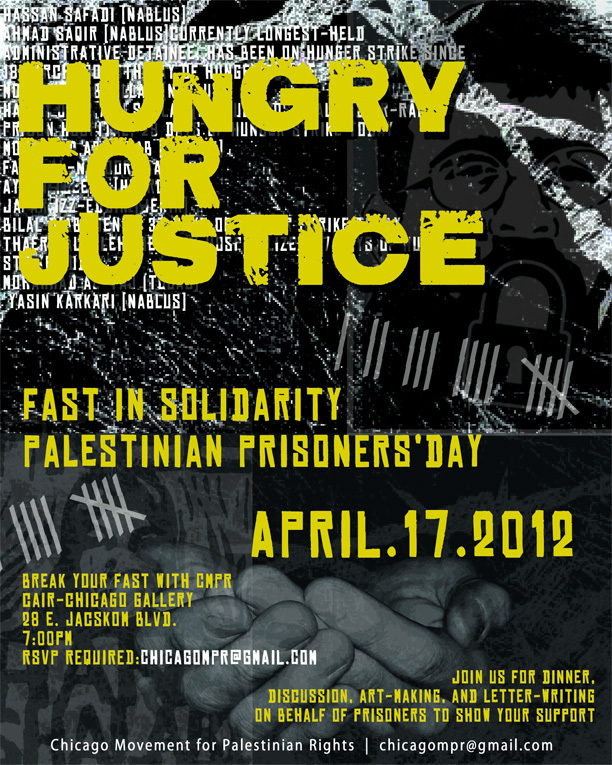 Since then, Adnan has issued a call for April 17, 2012 to be observed as a Day of International Action on behalf of Palestinian prisoners. In response to his call, events have been scheduled to take place all over the world that day, from Vancouver to Brussels to Amman. Since 1974, April 17 has been commemorated annually as Palestinian Prisoners’ Day. Currently there are more than 4500 Palestinians in Israeli prisons and detention centers; nearly 200 of these prisoners are children. Just like Hana Shalabi and Khader Adnan, 320 prisoners are held – without charge or trial – under administrative detention. 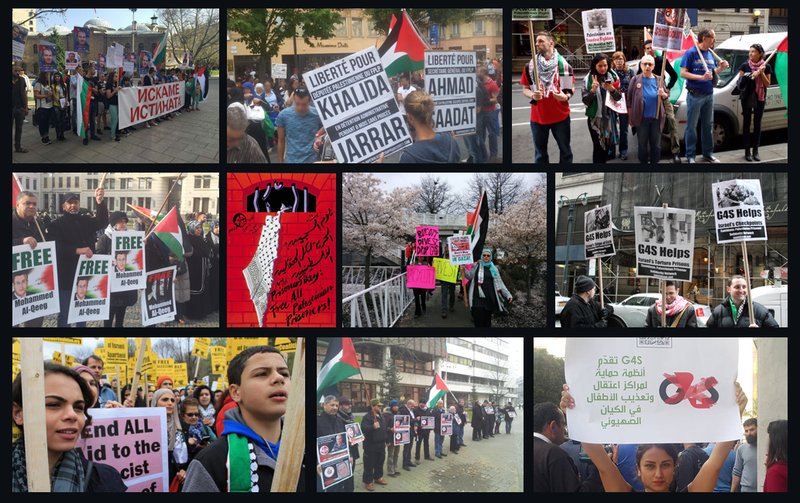 Here in Chicago, the Chicago Movement for Palestinian Rights (CMPR) is calling on people of conscience to fast from sunrise to sunset on April 17 in solidarity with Palestinian prisoners. According to latest reports from prisoner rights group Addameer, 8 prisoners are currently on hunger strike. Joining us that evening via Skype will be Bekah Wolf. She is a Jewish-American activist and co-founder of the Palestine Solidarity Project. Married to former Palestinian prisoner Mousa Abu Maria, she lives in the town of Beit Ommar and has worked in the West Bank since 2003. She will speak on recent developments in the prisoner rights movement, with a special focus on child detainees and administrative detention. Attendees will also have the opportunity to write letters on behalf of Palestinian prisoners, make political art/posters and network with local solidarity activists. Dinner will be provided by generous local businesses. Vegetarian options will also be available. Attendees are encouraged to bring a dessert to share. Click here to learn more about Khader Adnan’s call to action and to find out about events in other cities.